some of the greatest names in the sport’s history. On April 9, 1988, Eddie Hill broke the 4-second barrier in his Pennzoil Top Fuel dragster at the Texas Motorplex in Dallas, TX (It was an IHRA event. The NHRA saw its first 4-second pass on October 6th of that year when Gene Snow ran a 4.997 elapsed time in Houston). The NHRA world waited for the first 300 MPH Top Fuel pass on record until March 20, 1992 when Kenny Bernstein jumped that hurdle at the Gatornationals in Gainesville, FL. One year later, on the same October weekend at the Sears Craftsman Nationals in Topeka, KS, the sport’s first 4-second Funny Car pass and 300 MPH run were both scored by Chuck Etchells and Jim Epler, respectively. On May 20, 1994, Kurt Johnson powered to Pro Stock’s first 6-second run in Englishtown, NJ and on April 25th, 1997, his dad, Warren Johnson, ended Pro Stock’s quest for the first-ever 200 MPH top speed during qualifying in Richmond, VA. Meanwhile, in Pro Stock Motorcycle, not a lot of attention was being paid to any potential performance milestones while the world celebrated the records being set in the other three professional classes. Elapsed times for the bikes in 1996 were in the 7.30 range while the fastest speeds hovered around 180 MPH. The thought of a 6-second pass in the bike class wasn’t even on the radar screen and a 200 MPH run? That was something beyond imagining. 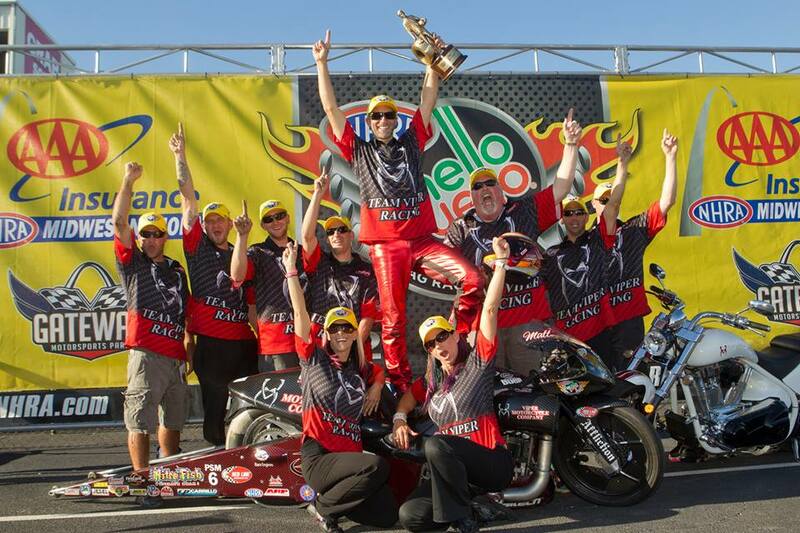 NHRA Pro Stock Motorcycle performance has greatly improved over the years. Andrew Hines put up the first Pro Stock Motorcycle 6-second run at the Gatornationals in 2005. So, when Andrew Hines put up the first Pro Stock Motorcycle 6-second run at the Gatornationals in 2005, there were many drag racing, fans, experts, and observers who were convinced the last great quarter-mile performance milestone had been achieved. Top speeds in the category were in the neighborhood of 195-197 MPH and the likelihood of a bike cracking the 200 MPH mark seemed from implausible to impossible. Up until a couple of weeks ago, the NHRA Pro Stock Motorcycle top speed record was held by Eddie Krawiec, 199.26 MPH. But at this year’s Four-Wide Nationals in Charlotte, NC, Hector Arana Jr. went even faster, 199.88 MPH, setting the NHRA national record and, perhaps, setting the stage for a 200 MPH speed sometime in 2015. 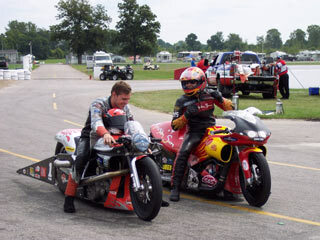 The NHRA Pro Stock Motorcycle top speed record was held by Eddie Krawiec, at 199.26 MPH. 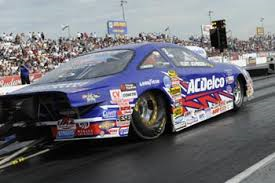 But at the 2015 Four-Wide Nationals in Charlotte, NC, Hector Arana Jr. went even faster, 199.88 MPH, setting the NHRA national record and, perhaps, setting the stage for a 200 MPH speed sometime soon. What makes that double-century speed quite possible is the fact the bikes have yet to visit the tracks on the NHRA tour where altitude, air temperature and air pressure are most favorable for peak performance. With stops coming up this season at such venues as Englishtown, NJ, Chicago, IL, Reading, PA, and Dallas, TX—where “mineshaft conditions” are not uncommon—Arana (or anyone else for that matter) could make motorcycle drag racing history’s fastest run. 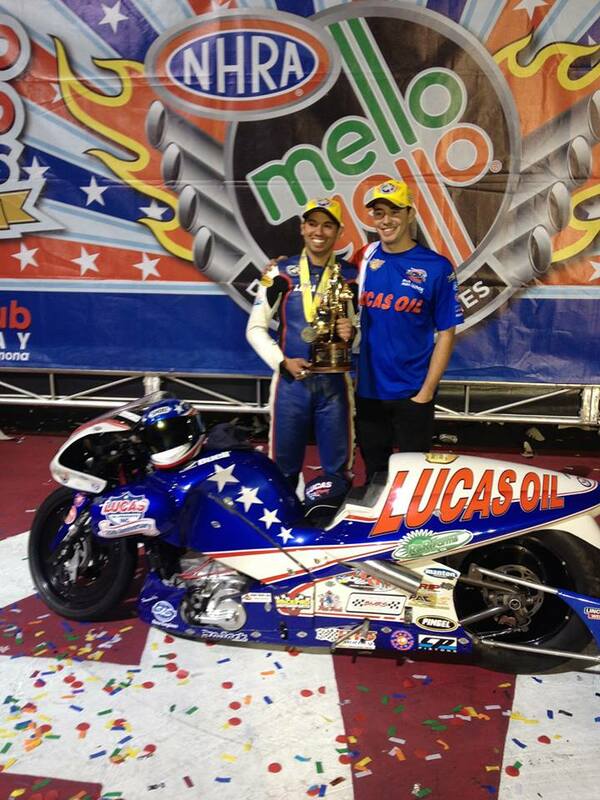 Hector Jr. and Sr. may be the favorites at this point to be the first to eclipse the 200 MPH barrier and the younger Arana has made no secret that having that accomplishment find a place on his Lucas Oil team would be a major goal for him this year. “The first one who does it will go down in history,” he says. “Nobody remembers the second person to set a milestone”. “The first one who does it will go down in history,” Hector Arana Jr. says. “Nobody remembers the second person to set a milestone”. Hector Jr. makes a good point. Everyone knows Kenny Bernstein was the first driver to 300 MPH but few know that it was Doug Herbert who was next in line. And one of the oldest trick questions in motorsports is, “Who finished second in this year’s Indianapolis 500?” Only the hardest of racing diehards can answer that off the top of their head. The final great drag racing performance milestone has yet to be broken. Since Top Fuel and Funny Car racing is now conducted on a 1000-foot racetrack, we’ve seen the last history-making elapsed time or top speed we’ll ever see in those classes. A “3-something at 300-something” is as quick and as fast as the nitro future holds. Pro Stock will whittle away at the 6-second e.t’s we see now but I’m not betting on a 5-second Pro Stock run in my lifetime unless the rules are drastically changed. Pro Stock speeds will creep up over time but there’s no earth-shattering number that everyone in the class will be relentlessly chasing to become the first to exceed. No, the first Pro Stock Motorcycle racer to bust through the 200 MPH barrier will, indeed, lay hold to the last great performance milestone you and I will ever witness. Who will be known for the first 200 mph Pro Stock Motorcycle Pass? The celebration may look something like this. That will be the person we’ll all remember. Some try for their first million dollars, some want marriage and kids, some have so many things they want they put them in a bucket list. Everyone in our class wants to be first to 200. Thank u for covering this milestone. See u a 2:00 for our meeting… Or was that after 200 for pictures. 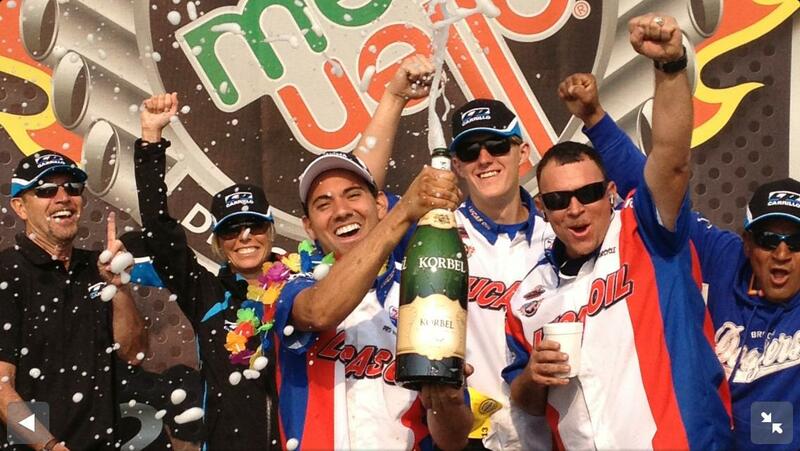 No matter who does it, it will be great for the Mello yello series in Nhra and the pro stock motorcycles. If you’re the first one to do it, it will lead to the most unforgettable interview in NHRA history. I’ll be watching, Ol’ Friend! Whoever breaks the 200 mph barrier will bring Pro Stock Motorcycle back to the forefront in the drag racing world. When it happens, will be a happy day for all us 2 wheel fanatics.